Technology is getting an enhancement, and in web hosting, cloud web hosting is in the boom. Amazon and Google are the dominant players by giving multiple instances from the different location. But now the hosting also started their cloud service. So we decided to bring your the review of cloud hosting. We have chosen Hostgator Cloud Hosting as our first Cloud Host. Because one of my friends just brought the Hostgator Cloud Hosting and is ready to share the same for few days. 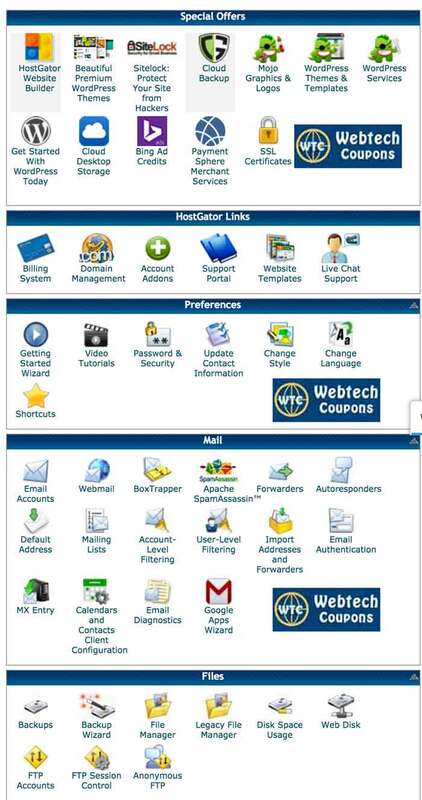 So here is Webtech Coupons bring Hostgator Cloud Hosting Reviews. We bring the complete overview of Hostgator Cloud Hosting. 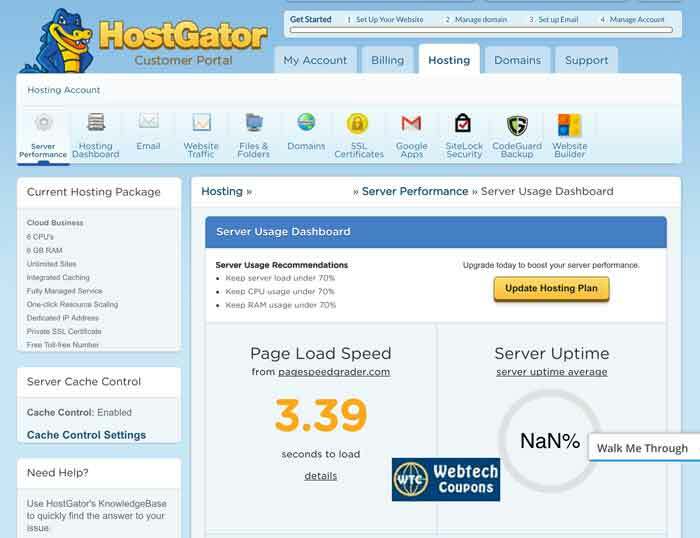 Also, Shared our review on Hostgator Cloud Web Hosting on pure uses basis and real-time testing. We are going to bring all the aspect of Hostgator Cloud Web hosting regarding features and real-time uses. We will test the hosting and support in real time environment and uses. 2x Faster – Hostgator Cloud Hosting claims that it is 2x faster than standard web hosting. 4x More Resources – When you need you can scale your resources which mean easy handling of higher traffic. Integrated Caching – Hostgator Cloud Web Hosting comes with optimal caching configuration. It is specially built to give speed and faster load time. Data Mirroring – It automatically mirrors the data to 3 different locations which give high safety & redundancy. Automated Failure – Any hardware issue comes, the website will automatically switch to other servers. In another hosting service, you have to face downtime in these type of case. So it is one of the best features that we liked in cloud hosting. Intuitive Dashboard – Help you to track website speed and resource utilization. It dashboard help you to keep an eye on many important things. Cpanel – The best thing that we love and you will also like the Cpanel. It makes all your hosting task easy & manageable. Above are the main highlights of Hostgator Cloud Web Hosting. Many people are not able to shift on cloud hosting due to its complex build. You need to have sound knowledge of command line and server programming. But now hosting companies with their custom control panel made the things easy. The company brought three different plans for its users. It gives three choices as per your need and requirements. The plan name is same as shared web hosting. But have a significant difference. Hatchling Cloud – It is very basic cloud hosting plans which are made to run a single website. The power given to the plans seems ok to run both static & dynamic website. Pricing to appear to be right you have to pay $7.16 per month which looks like high but when you will see the feature it will fair. Baby Cloud – It is much better Cloud Hosting plan because you have to pay just $.61 extra and you will get the double resource and can run countless websites. It makes Hostgator Baby Cloud plan on of the best cloud hosting offering. Business Cloud – It is top cloud plan where you will get higher resource along with SSL and Dedicated IP address. If you want to make your website more secure and SEO friendly this is the right plan for you. Hostgator comes in top web hosting company around the Globe. But they bring the cloud hosting is service in 2018. It seems quite late. But if the service is good then it is going be a big hit. Let us start with a real-time overview of Hostgator Cloud Web Hosting. It’s very easy to buy Hostgator services. All in done within 2-3 minute of time if you are ready with all the requirements. Choose the cloud hosting plan you are willing to buy and click on Buy Now Button. Here you have to put all necessary details to get your hosting account. You can even change to hosting plans and see the final rates that you have pay for the different period. Finally, click on checkout now button, and you have through with your payment. If you are a new user, then you will get a thanks email where you will get login details for your billing portal. After that, you will revise a second email where you will get login details for Cpanel. Here you will get a username with tough to remember. Both the panel are necessary for cloud hosting. In billing panel, all the real-time stats and uses of Hostgator Cloud Hosting are shown. Above you will see the screen capture that we make from billing panel. You have to click on hosting tab, and you will get a page like this. 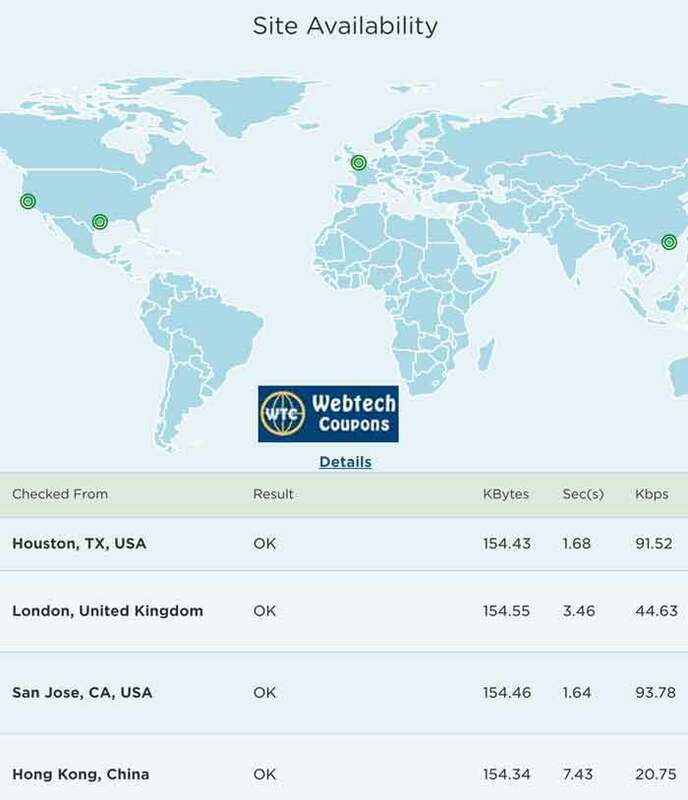 It shows the average page load speed that 3.39 second. In your left find what you got in the hosting package. It is the panel where you will get complete cloud hosting performance. Now you will see in below image company provide four different instances of cloud hosting. Means your data is maintained in four different location and delivered to the user from nearest one. The Cpanel come with a lot of customization which has a lot of discount offers and free advertising credits. We are happy to see what Hostgator give in it Cpanel which come with lots of custom add-ons and knowledge base. But what we not like is the process which is just limited to 25 as shown is CPanel. The low process indirectly restricts the traffic of the website. But it may be that we have four instance means 25*4 processes. We will clear this point with their supports team. Support team updated Us the 25 Process is enough to run 4-5 websites. Now we have to do the test to see the real time results. Hostgator Cloud web hosting come with lots of features and offers which make it one of the top services in cloud hosting field. The company provides a significant Knowledge base to solve the common problem for users and also help the news user with very fundamental issues. We have three ways to contact Hostgator Support team – Live Chat, Email / Support Ticket and Phone support. Hostgator Live Chat – Really say it have a very long waiting Que. Seems link you will have to wait for such a long time. We waited for more than 90 minutes and finally closed the chat. Phone Support – It seems very fast just get in touch with an executive in less than two minutes. You can connect to US support any time by dialing +18669642867. Email / Ticket Support – You can use this support from billing panel or directly email on support@hostgator.com. They may you ask for verification so give your security Pin in your first email. They respond in 2-3 hours. But I happy with this rather waiting for the longer time in waiting for live chat and phone support. We have nailed down each and everything that we know checked on Hostgator Cloud Hosting for the month of 2018. We will make the change with any major update about the same. Now it’s time to give our review after testing the cloud hosting. Hostgator Cloud Hosting Support – I will say Hostgator have most busy support which makes the thing irritating for which it scores only 3.5 out of 5. We say phone or Email support, and Live chat support is worst in our case. Hostgator Cloud Web Hosting Features – It comes with fully loaded with lots of add-ons. We also have multiple server locations which makes one of the best cloud hosting we give it 3 out 5 regarding they bring for their users. We thought data would also be delivered from multiple locations. But in real it comes from a single server other servers come in play in case of failure. Hostgator Cloud Web Hosting Pricing – Pricing that Hostgator offers for Cloud Hosting seems reasonable. Here they have to maintain the server backup in three different locations. So we will also rate it 5 out of 5 regarding pricing. Hostgator Cloud Hosting Other Factors – We like the offer and features that Hostgator Cloud Hosting gives. But we not like the process that they provided in Cpanel which limits it power. So it will be 4 out 5 for all other factors. Hostgator brings a promising service is terms of the package. But multiple location deliveries is missing which limits the cloud hosting real feature. The company should include inbuilt CND network to look this factor over. But it is the real alternative to shared web hosting packages. 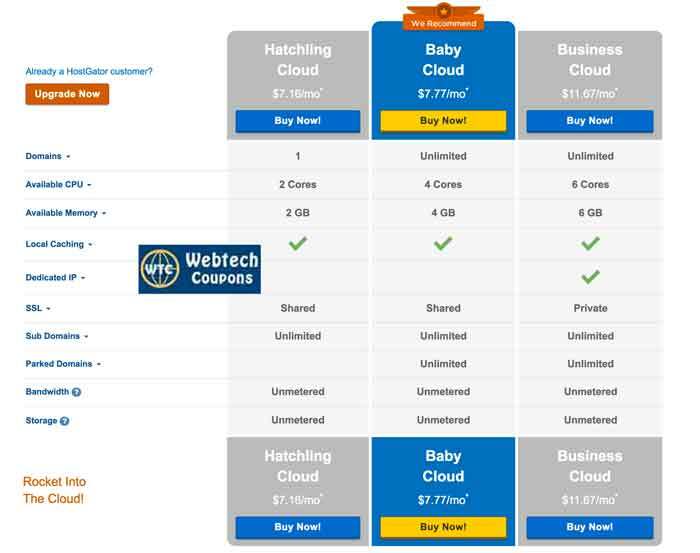 Measuring after your expert Overview I have taken the baby plan of Hostgator cloud web hosting. It is truly truly awesome plan. i have shared this to my Friends they also give the positive view after see this. I totally agree with your Review @Adney. i think you should have take Business Cloud plan of Hostgator. it has more space, more cores and it is unlimited. and its ssl is private which will give more efficient look to your project.